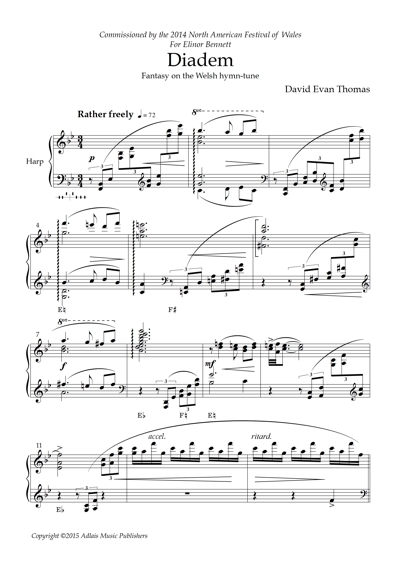 Diadem, a fantasy on the Welsh hymn-tune, was written for the eminent Welsh harpist Elinor Bennett for premiere at the closing Gymanfa Ganu (hymn festival) of the 2014 North American Festival of Wales. 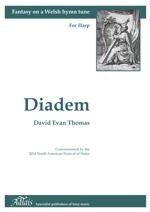 The tune “Diadem” is most often sung in English to the words “All hail the power of Jesus's name”. The work breaks the tune into recognizable fragments, moving from rather free tempo to vigorous syncopations to a grand final presentation.